The Romance of the Three Kingdoms was a Chinese historical fiction novel written in the 14th century, and it wasn't about romance at all—well not romance as in love. 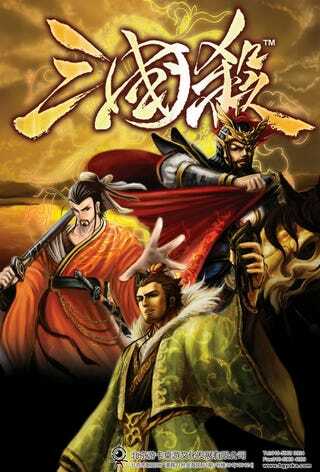 It is a story about the struggles of three kingdoms and their battle for power and dominance over China. The story is full of treachery and brotherhood and even some romance. The Three Kingdoms story has been made into many comic books, television shows, films, and games, most famously Koei's Dynasty Warriors and of course John Woo's 2008, 4-and-a-half hour film epic Red Cliff . It is an integral part of Chinese culture. You would be hard pressed to find a Chinese person who didn't know the story of the Three Kingdoms. Back in late 2008, four students took the whole Three Kingdoms motif and basically melded it with the American board game Bang; the end result was Three Kingdom Killers. The basic premise of Three Kingdom Killers is exactly the same as Bang: each player randomly selects a player; one player is the lord while the other players could be allies or enemies. Everyone's role except the Lord is hidden at first. The playable characters are Lord, General, Insurgent, and Spy. The mission of the Lord is to destroy all Insurgents and Spies. The Minister's job is to protect the Lord while killing the Insurgents and Spies. The Insurgent's mission is to only kill the Lord, while the Spy's mission is to kill everyone and then the Lord. On top of the character cards there are basic cards such as attack cards, dodge cards, and health cards aptly named "Peach Cards". Each card bears the name of a famous character If you are a fan of Dynasty Warriors you will definitely know the characters in Three Kingdom Killers by name. A typical game of Three Kingdoms Killers has 2-10 players and lasts anywhere from 20-60 minutes. Perhaps the biggest draw of the Three Kingdoms Killers, is that it's a social game in the truest sense of the word. It's common to see large groups of Chinese people playing the card game in cafe, or just two or three students in a restaurant with their laptops out cursing at the screen because their Lord had been slain in the PC version. Three Kingdom Killers' popularity has been such that a simplified online version was created to give players who don't have the finances to purchase cards an opportunity to play the game. Due to the similarities of how Three Kingdom Killers is played, there has been a lawsuit by the creators of Bang against the Beijing Yoka Games company, the company that publishes Three Kingdom Killers. There have been no recent developments on the case. You can play 三国杀 online by registering for a free account.